This textbook, published by Oxford University Press in 2011, is intended for seniors and beginning graduate students. 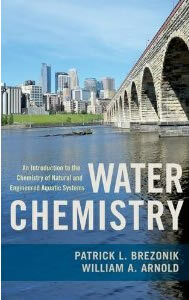 The book represents a fairly comprehensive approach to the subject, covering the principles of equilibrium chemistry and chemical kinetics for both inorganic and organic substances in aquatic systems, and it features applications to both natural waters and engineered aquatic systems. Powerpoint versions of the textbook figures are available from the authors. Please contact me for access.